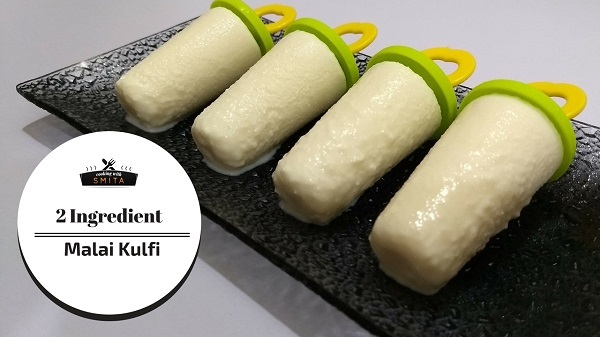 Today I am sharing another recipe of Kulfi, an Indian Ice Cream made from Milk. 2 Ingredient Malai Kulfi Recipe. This Kulfi is made using Full Fat Milk and Sugar only. Watch this step-by-step recipe video on how to make Malai Kulfi at home. Add Milk in a heavy bottom Non-stick pan. Heat milk over a high flame and bring it to a boil. Once Milk comes to a boil, reduce gas flame to low. Stir continuously and boil over low flame till Milk remains in half while scraping the sides in between. When milk reduces to half, add sugar. Stir continuously and boil milk for another 10 minutes. Switch off the gas and let it cool down to room temperature. Pour it into Kulfi Moulds and freeze for 6 – 8 hours until firm, frozen and set. Once set, it’s time to serve. To remove the Kulfi from the mould, rub in between your palms for 5 – 10 seconds and it will come out easily from the mould. Garnish with chopped Pistachio or Almonds and serve immediately.